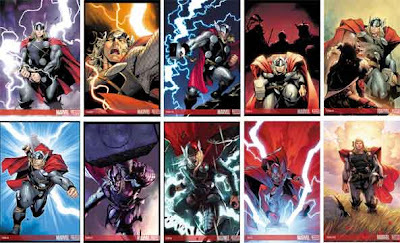 Thor, god of Thunder and son of Odin, was dead along with all the other gods of Asgard. His earthly persona known as Dr. Donald Blake helps to bring Thor back to the realm of the living. Thor recreates Asgard and seeks to bring his brethren back to life and return Asgard to its former glory as home of the gods. He finds land in Texas and reestablishes the grand kingdom, which piques the interested of Iron Man and the rest of The Avengers. Of course, there is history between them – bad blood caused by CIVIL WAR – but a political compromise is forged, at least for now. With renewal comes millennia-old baggage: deceitful and jealous gods, frost giants, and much more. Once again the Asgardians must fight foes from within and without and set the world right. THOR is an outstanding blend of Norse mythology and Marvel universe – a concoction of legend and spandex, caped, armed and ready to battle the external forces of evil and the destructive manipulation of internal politics. Superheroes may not be real, but the situations they endure, albeit allegorical at times, are authentic. Thor’s sibling, Loki, is the perfect example of one who seeks the deception and destruction of one’s own kind, and yet is a necessary part of life. From that perspective, THOR is indispensable literature for the student preparing him or herself for the hardships of life. Choices must be made and the consequences, no matter how destructive, must be accepted. THOR is beautiful in its presentation of friend and foe, foreground and background, details, composition and layering. The book is not inappropriate for most middle school kids, but the comic is not necessarily intended for children. The ladies can be more scantily clad and sexual themes are suggested. Magic, gods and goddesses, and strong fighting scenes with blood splatters are frequent. There are sexual themes, too. For the reasons stated above, this comic has a specific impact on teens that is apropos to their lives. High school is full of politics, intrigue, switchbacks, backstabbing, plots, alliances, severed friendships, disappointment and double crosses and so is THOR. Real life comes alive in this superhero tale. A movie tie-in is scheduled for release in July 16, 2010 and will be directed by Kenneth Branagh. I do not recommend the book to just any high school classroom. It should have a purpose, a goal, in order for THOR to be appropriate, but THOR has its place for the right students in the right classroom. The story is great and the opportunity for a lengthy backstory (especially with CIVIL WAR) is available. Did you know there is a difference between Chinese dragons and Japanese dragons? There are many differences, actually, but I noticed one in particular. Chinese dragons have five toes. Japanese dragons have three claws. It may seem an insignificant difference to westerners, but not for the Chinese culture. Count the toes in YU THE GREAT and you will find your first clue that Storrie and Carruthers did their research. YU THE GREAT is a fabulous tale of family loyalty, honor and duty. 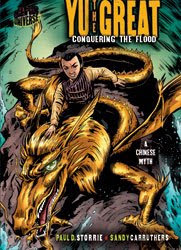 Yu was an honorable hero, unlike his father, whose selfless acts saved all of China from the deadly flooding. But the personal costs were high, indeed. The research and clarity of the story makes for a great read and the art really accentuates the story and punches the many emotions of Yu. When completing a practicum experience with a fifth grade class, I noticed right away a high interest genre with many of the boys: mythology and legend. This group of kids routinely checked out books on mythology from the library. They simply could not get enough. I brought in the three titles I had (HERCULES, YU THE GREAT and BEOWULF) and they loved them, seeking out more titles from the library. Those are, of course, the experiences we wish to offer our students. Self-discovery – inquiry – drives authentic and long-term educational experiences. With these graphic novels, a powerful unit on myth and legend could be designed. A compatriot of mine, Paul Epps recently wrote a lesson plan comparing and contrasting myth with science – discussing the roles that each play within society and the questions both try to answer. Paul used HERCULES in that lesson plan, which will be published later this year, but other myths and legends would be just as applicable, especially if students are charged with creating their own myths in order to explain a natural phenomenon. These myths and legends are also a great way to student other places, countries, and societies, and help them related to students of different nationalities. Understanding the subtle differences in culture and imagery make for a more hospitable community. Dragons in Western society conjure up images of destruction, as dragons are seen as hostile. Dragon imagery in Chinese culture is much more benevolent and symbiotic. YU THE GREAT offers many learning opportunities in the classroom. This is excellent mythology aimed at a particular age group: tweens and early teens. COMIX WITH CONTENT is a series of comic books produced by writer and illustrator Bentley Boyd in a way that engages young learners on a variety of levels in the subjects of history and social studies. 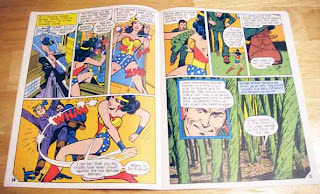 The comic collections are grouped around different themes (such as The Civil War or The First Americans) and each bound book consists of a series of about two dozen one-page comics. This compilation technique is no doubt the result of these being first published in the newspaper (The Daily Press of Newport News, Virginia) but it also makes it quite handy for the teaching of concepts in the classroom. Boyd also titles each comic page with an essential question. In the COMIX WITH CONTENT: GOVERNMENT BY THE PEOPLE comic, for example, I turned to the section on presidential elections. 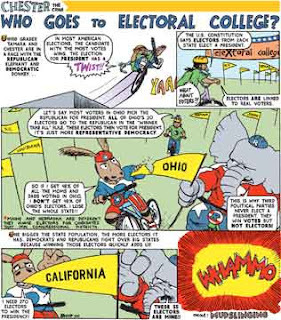 The overarching titles for the comics here range from "Who Represents in America" to "Who Goes to Electoral College?" Which is to say, these comics could have been boring and seen as yet another cute use of comics. But they are not. Boyd wisely enlists the use of a handy mascot -- a blue crab named Chester -- to show the reader all of the ins and outs of a given topic of history. Chester cracks jokes, engages in the art of puns, and often brings along a "student" from modern day right into the historical period of the comic. For example, the five pages of the section around United States presidential campaigns is an interesting look at how the president gets elected, with clear explanations about the two main political parties, an overview of the concept of representative democracy and even an investigation into the ethical responsibilities of candidates to speak truthfully and civilly in a campaign (perhaps someone should pass this book along to the Democratic and Republican National Committees). A related book in the series – COMIX WITH CONTENT: CONSTITUTIONAL CONSTRUCTION – examines how the United States Constitution was constructed, and why it was created the way it was, starting with the philosophical ideas of John Locke, moving through the heated debates of James Madison and Patrick Henry over the separation of religion and government, and ending with the creation of the three-part government and balance of powers. That's a lot of ground to cover, yet Boyd does it so effectively and with such good humor (using Star Trek analogies along the way, even) that I barely realized that I was learning new things as I was reading. Boyd packs a lot of punch into his one-page comics, using Chester the Crab as a humorous foil in contrast to the serious nature of the topics at hand. The cartoon elements of the comics are playful and dense. For example, on the comic entitled "How Do Parties Pick Candidates? ", Boyd uses almost the entire page, showing a bicycle race between a pack of donkeys and a herd of elephants. We see some of the party candidates "crashing" due to lack of funds and lack of voter support, and winners emerging victorious at the finish line. This visual strategy is very effective, and Chester is not the only source of humor. I may be wrong, but in one of the books in the series, I think I saw an image of Weird Al Yankovich peeking out from behind a rock. You never know when you might come across a reference to science fiction or a superhero (such as when the hero, Pressman, is introduced to explain the concept of the free press in a democracy). Boyd understands the power of the visual and he uses it to good effect here. The books in the series are readily available at Amazon.com and cost only $5.95 each. You can preview some of the books at Boyd's site. The COMIX WITH CONTENT series would be valuable for any classroom, although I would guess the primary audience would be middle school students. Boyd has said that he purposely puts a question in the title because he imagines that teachers could use that as a writing prompt before sharing the comic itself. Boyd thinks like a teacher. 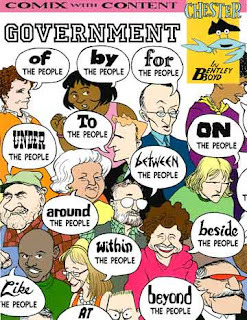 The COMIX WITH CONTENT: GOVERNMENT BY THE PEOPLE comic would be a good companion to a textbook and the front pages of the newspaper these days. Students could even compare and contrast the ways that a writer might relay important information in multiple media. 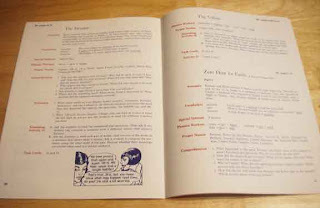 After all, a single page comic provides a tight frame for information and a writer, such as Boyd, has to determine the best way to get the main message across. For teachers, there is also a handy index at the end of each comic book, giving page numbers for references inside the text. And Boyd has been developing lesson plans for teachers using his comics. The lesson plans are free at his website. I would highly recommend any of the books in this series for the classroom. Boyd effectively uses the comic medium to relay important concepts to the reader and all of the comics in this series seem thoughtful, dense and fun to read. 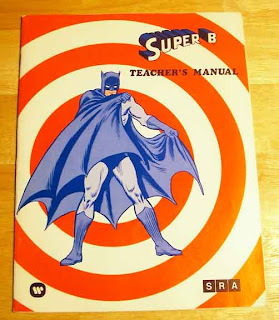 Although the comics could be read by a wide spectrum of students, the text and concepts are probably more appropriate for middle school and lower level high school students. (Although even young readers would get a kick out of following Chester the Crab around). This is the last week of Lunch-N-Munch, my lunchtime comic book reading club for fifth graders. It’s been a wonderful experience and I am going to miss the kids. They truly enjoy the experience and appreciate having comic literature to read. A local comic store contacted me today and stated one of the book club members came in and bought Tiny Titans. While the comic book club is near the end, so this semester is also drawing to a close with just four more weeks to go. Then all that is left is student teaching. I realized just how close I am to graduating over the past few days as I took the Praxis II exam for my certification and as I was preparing my educational résumé. I must admit that it both excites and scares me. Mostly it excites me. Thankfully for me – or should I say luckily – I was placed in a classroom last semester with a teacher who is open-minded and embraces innovation. In what was the last practicum I would experience before student teaching, I told fifth grade teacher, Amie Turner, about my work in comic literature and asked her for permission to introduce comics to her students. She agreed, which set into motion a host of changes for her and me. Come to find out, not only did I learn from her, but she learned from me as well, and we both gained a friend in the process. I will always be indebted to her for her instruction and mentoring. Her consult means everything. This semester I needed a classroom to volunteer in, so I asked Turner and she agreed again. This time, I am conducting a lunchtime comic book reading club. The hope is to come back later and use the classroom for a causal-comparative research study, which is research conducted after the fact. For now, it is just a volunteer reading club conducted during lunch. This Lunch-n-Munch book club has received a lot of attention from the local media. One television station, KOLR 10, just covered the book club, putting those excited faces on the news and interviewing a couple of them. The Community Free Press also caught wind of the story and interviewed the kids and me. The CFP also put in pictures of the kids. (All students pictured had media release forms.) The students love being interviewed and having their pictures in the paper and on TV. More importantly, of course, is the fact that the students look forward to reading … at school … during lunch … on their own time. For them, reading has become an adventure, a treasured experience. Isn’t that what reading is all about? I thought I would share our success with you. 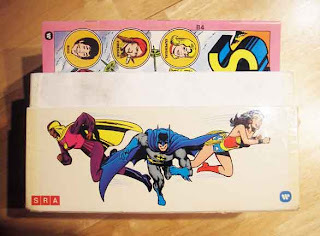 If you wonder at all if comic literature is appropriate for the classroom, see these media reports, use them to back up your decisions, and to reaffirm your commitment to instill positive reading habits in your students. Read the KOLR 10 transcript and watch the video here. Read the Community Free Press story here. It’s been a great week so far. The Classroom has had some wonderful media coverage, which we will post when it hits the shelves or the tubes. I’m working in a classroom, hosting a volunteer lunchtime comic book reading club in an elementary school. It’s going great. I cannot wait to update you on that. Larry Gonick has done a lot for the subject of history, mostly by keeping the warts, the birthmarks, and the hate in the story. It’s not a pretty sight, really, what America has done at times, but it is history – our history – and Gonick brings it to life, boils it down, and gives us a good perspective on the real America from 1585 to 1991. He is quite good at presenting a 360-degree look at some of the controversial issues that have cropped up over the past few hundred years. We learn much about the society and the complexities that have shaped our current community. Gonick is especially adept at two things: viewing history using different contexts, and inserting his sense of humor in the art and information. He pokes at our bumps and bruises and yet still gives the reader a balanced and humorous presentation. Although it is only 400 pages, Gonick goes further and digs deep, giving us details that the average adult, let alone the average student, will have not heard of or recollect. Gonick’s art style could be described, perhaps, as a melding of Calvin and Hobbes and School House Rock. More cartoon than comic, his artistic style is quite effective, giving us the nitty-gritty without bogging the reader down. 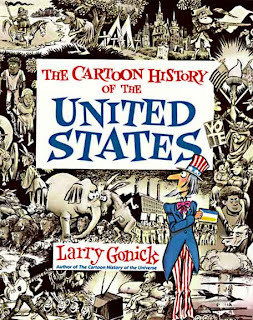 I don’t often recommend a book for ages younger than the publisher’s recommended age; however, Gonick’s CARTOON HISTORY OF THE UNITED STATES has more in line with interesting history than most textbooks and really nothing objectionable, except for history, which is often quite offensive and disgusting. Still, I think the publisher’s recommendation is too high. I would not suggest buying every fifth grader a copy, but I do think a teacher could make use of certain aspects of the book even in elementary. If memory serves, there was a “Hell” or some other mostly innocuous curse somewhere in there, but other than that Gonick’s book is about history. Sure, it mentions sensitive subjects, but nothing that any good, red-blooded student of democracy should not know. Not only is this book great for the high school history classroom, but also for that non-traditional student who needs to occupy his or her mind with an unconventional but factual education. Schools need more historical books of interest to students. There is no reason that history must consist of lectures and memorizations of names and dates. The politics, the controversies, and the philosophical debates that have shaped our nation are significant and are interesting when given the right presentation such as Larry Gonick’s CARTOON HISTORY OF THE UNITED STATES. Four weeks ago I began my research study on comic literature for my master’s thesis. I am working with a classroom of fifth graders, conducting a volunteer lunchtime comic book club to promote reading. After the pre-survey, I introduced the students to the various comics and graphic novels, giving them a synopsis of each of the titles. I pulled out NEOTOPIA, a book about a strong princess who must take charge and lead her nation in the face of an invading army of nasty creatures. “Ladies, if you want a book about a strong girl …” [loud gasp from the girls] “… who is the only one who can save her country, then this is it,” I said. I relish the sound of children who are excited about reading and it delights me when I offer girls books that can speak to their femaleness; books that connect with their inner woman; books that promote strong, independent, intelligent females who can make a difference in the world around them. I love the sound of girl power, and I silently gasped with them. And so you can understand why I gasped for the girls when I discovered a new comic biography series focusing on contemporary female trailblazers. FEMALE FORCE, by Bluewater Productions, is a bi-monthly, full color comic dedicated to preserving the stories of today’s influential women. It may have been true in the past that comics were geared for boys; however, that trend is changing rapidly with efforts such as FEMALE FORCE. As the genre gains legitimacy as a true form of literature, and as it increases in popularity, more and more books are being designed for wider audiences, including females and children. When creators and publishers take on the mission to create for the larger audience, the popularity and legitimacy, in turn, grows too. “My hope is that an honest and thoughtful portrayal of women of worth will drag in readers across the board, and if response is any indication, it's working,” said Davis. The first book, due in January, is a biography about Sen. Hillary Clinton. The second book will feature Gov. Sarah Palin and is due out in February. From then on, the series will be bi-monthly. The stories will be collected every four issues and bound together. Political figures are not the only subjects. While Davis will not reveal who will be the focus of the third book, he did say “the next one will be a television icon who has made a huge name for herself during the era when television was a male driven arena.” So far, the women will be modern females, mostly because those of yore have been covered extensively and Davis wants the series to be contemporary and immediately relevant. Why comics? Davis has a reason – a story – and it’s one that you’ve heard before and will hear again. “I had a hard time reading as a kid and comic books helped me get over that. So I want to take these biographies and be able to have others learn from the non traditional book medium.” Those of us involved in comics have heard that story time and again from adult readers. Comics, it seems, was a significant and motivating factor in the life long reading habits of many a person, including Davis. Now his company is creating biographies of important women to inspire a new generation of readers. Update: Because of the election, Bluewater has adapted it's schedule for Female Force. 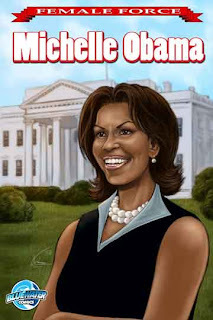 The next biography to hit shelves, after Clinton and Palin, will be one on future First Lady Michelle Obama. Are you tired? Me too. The election is over and the commercials are done. Life can return to normal. 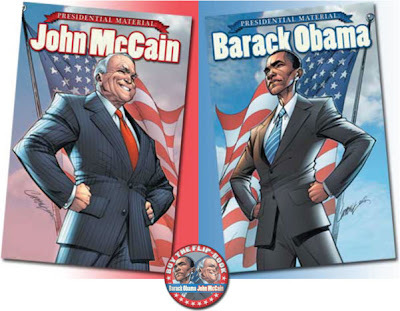 If you used the presidential comics in your classroom, we would appreciate your thoughts, comments or observations. You can email us privately at abikerbard@mac.com or leave comments. Don't forget about our Great Halloween Giveaway. We are out shaking the trees and banging the drums in an effort to promote the use of comic literature in the classroom. My local area magazine of higher living, 417 Magazine, asked us to write a story about our efforts to use comic literature in the classroom. Click here for the story. We decided to post our reviews early this week because of the election. So you have two reviews of the presidential comics of John McCain and Barack Obama by IDWW. By the way, I saw the flip-book along with other election-related fare on a special table at Borders. Enjoy. It is commendable that IDW Publishing has created these two comic biographies of the United States presidential candidates. 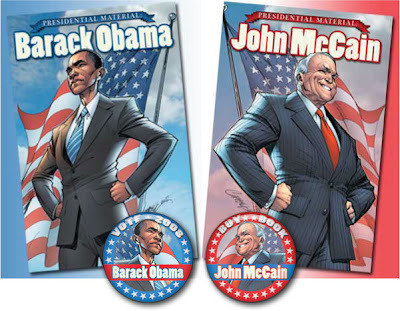 Although published as two separate comics, I picked up the flip-book version that has Republican John McCain on one side and Democrat Barack Obama on the other. I read both of the comics in one sitting and found them to be very interesting on a number of levels. The text is pretty dense, and I wish they had found some ways to edit down the stories a bit, particularly as we think about ways to have younger children access more information about the candidates. I can only assume that the real target audience here is adults, which makes sense when you consider the voting age requirements. As a former newspaper reporter, I also tried to read the comics through a lens of critical media. What I mean is: Did the comic book biographies seem slanted in any way or were they politically neutral? There will surely be some other readers who take issue with my assessment, but it appeared to me that the McCain comic dwelled much more on negative aspects of his career (mistakes he made when it came to campaign contributions) and personal life (not knowing his wife was becoming addicted to painkillers) than the Obama comic, which seemed to use more dialogue and storytelling right from Obama's book, Audacity of Hope. While McCain eventually emerges as someone who has paid attention to his mistakes and learned from them, the negative shadow seems already cast. And the writing seems to contain verbal jabs here and there against McCain. In the Obama comic, in contrast, the only negatives that emerge are his associations with controversial figures from the Chicago political grounds (such as Rev. Wright, former Weather Underground bomber William Ayers and developer Tony Rezko). On the positive side, the issue of "character" does emerge from both of these comics in a way that newspaper profiles and magazine articles often hint at, but don't always seem to address. The comic genre gives life to the world around these powerful men during key moments in their lives. We see McCain as a prisoner of war, grappling with ethical issues in the face of severe punishment. We watch Obama being laughed at by students when they hear his name being called out by the teacher, who further embarrasses him by asking what African tribe his father belongs to. In considering ways that voters can access information about the candidates, these comics serve a useful purpose and combined with other media, I hope people can make an educated and thoughtful decision about the person who will lead our country into the future in the midst of war and economic turmoil. The artwork here seems varied. At times, the images are vibrant and alive. But in some frames, there is a washed out, photocopied feel to it. And, to continue my political criticism from above, the washed-out illustrations are mostly in the McCain comic. Now, I acknowledge that there are different illustrators for each comic biography, so it is natural to assume that the art won't exactly mesh. But I would argue that, in considering the level of political fairness that must be balanced with this kind of project, particularly being published in the last month of a presidential campaign, perhaps they should have had the same illustrators working on both comics. Or am I just too critical? I had hoped to use these comics with my sixth graders, but it is clear that the writing is more geared towards older readers. Which is not to say that I have not kept the comics available in my classroom. I have. 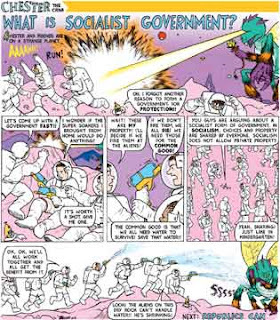 For older readers, though, I think the comics provide an interesting potential for comparing and contrasting the candidates on a variety of issues. Also, students could use the comic as an analysis of multiple media (comic, magazine, radio interviews, television, etc.) and examine the use of those media in a political campaign. I would highly recommend this for high school students. There are some moments in the McCain comic where he is being tortured that might make some teachers a bit sqeamish, but there is nothing there that is not talked about or discussed on the evening news. Let’s get right to it: Are the biographical comics about the presidential hopefuls – John McCain and Barack Obama – biased, slanted, or skewed? Are they nothing more than political propaganda, glorified stump speeches, glossy-paged propaganda? Are the comics aimed at disparaging one contender over the other? I am not sure there is a simple answer to those questions except to say that both comics treat the candidates with respect, while refraining from being nothing more than paid political advertisement. The historical warts and wrong doings of both candidates are addressed, as are their messages. Are they addressed equally? I suspect that one’s previous experiences and current political leanings may greatly affect the answer. I believe, for the most part, both comics are factual and fair; however, I also maintain that each book is its own title, independent of the other. Perhaps we need not compare them with one another, but compare each title to the candidate’s background. With such diverse candidates histories the stories are bound to be different, but does that not mean they cannot be fair? Again, that may very well depend on one’s perspective. That’s okay. TGC Staff Writer, Kevin, makes an interesting point when he compares and contrasts the artwork. Obama’s art is more vibrant, colorful and less detailed, while McCain’s illustrations are muted and more detailed. Is this a bias or simply artistic style? Should the publisher insist that there is more continuity between the two works? If so, would that visual continuity ensure more fairness? I refer you back to my earlier refrain: That may depend on one’s perspective. I’m not sure I have an answer yet. I think there are valid arguments on both sides. The coloring on both books was done by the same person. The fifth grade students in my comic book club were very excited about reading these comics. However, the massive amounts of text and difficult vocabulary reverted most of them to picture walks. The reading level was too high for most of them, something that Kevin also noticed. Like him, I made them available. These are probably best suited for more mature readers with a larger vocabulary and more practice with text. 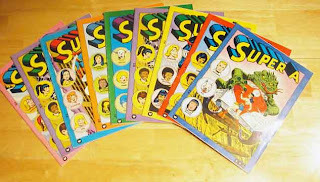 The comics are available individually for $3.99 each. A flip-book featuring both stories, each with it’s own cover, is also available for $7.99. 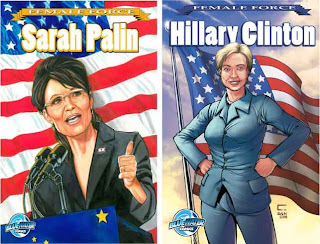 All in all, the presidential comics are a good piece of biographic information about both candidates. When considered independently, they are fair. But as Kevin pointed out, when compared and contrasted with one another, the answer might change. Without a doubt, these types of biographic comics are important in the classroom.